It was a couple of weeks back that I mentioned, to my surprise and delight, that Katz Gluten Free had seemingly put out some new products without me knowing about it. How that escaped my gluten-free radar, I’ll never know. But the fact of the matter was, one morning, I was puttering around and randomly went over to their site, only to be met by not one, not two, but three new flavors in their gluten-free donut line. HELLO!! When it comes to gluten-free donuts that I can buy commercially (aka: not from a local gluten-free bakery), Katz Gluten Free blows away the entire competition. Better than any of the ones I have ever pulled out of the freezer section at my local grocery or natural food store. I love these donuts. Especially the regular ones…not any that are filled. But, I’ve never been a huge fan of filled donuts anyway. Give me a classic cake or glazed donut and I am a happy girl. Yes…I am a nutrition freak. And yes…donuts are definitely not a nutritious food. But, I also believe in everything in moderation. When I start telling myself I can’t have something…that’s when cravings and unhealthy eating habits kick in. Allowing myself a little treat here and there is all part of finding balance in life. So…you better believe I ordered all three flavors of the new varieties. Last week, my roommate (for those of you who are tuning in, the roomie is not a Celiac and does not have to eat gluten-free) and I delved into the world of the new Katz Gluten Free Glazed Chocolate Donuts. And, man…were they ever amazing. Very reminiscent of my Dunkin’ Donut days…the Munchkins…the chocolate ones. That’s what they tasted like. It was enough to just…make me happy. And, let’s face it…the food you eat should make you feel happy…not guilty. Donuts included. That being said…this morning, after doing some strength training at the gym, we both headed into work with one of the other flavors of Katz Gluten Free donuts tucked away for breakfast. 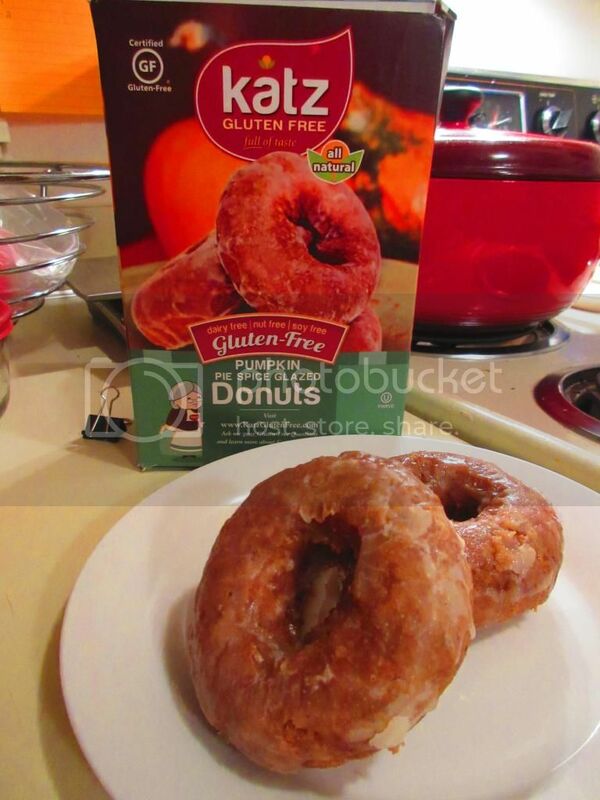 This time…it was going to be one of my favorite flavors…the Katz Gluten Free Pumpkin Pie Spiced Glazed Donut. Now, pumpkin flavored anything can either be perfect or it can be too much. Sometimes…even too little. I wasn’t sure what to expect from these donuts when I pulled them out of my freezer to let them thaw. I just knew it had the word “pumpkin” on it…so therefore I was one happy girl. I don’t need it to be fall to have some pumpkin in my life. So, they stayed out overnight to thaw and I packed them up that morning to have after strength training. Because…why the hell not? HA! Upon getting out of the gym and over to the office…I went into the kitchen and sliced up my grapefruit to have with the donut. I then microwaved both of them for about 20 seconds, letting that glaze get all gooey again…like it was fresh out of the bakery. And breakfast was that easy. And at that point, I was totally ready to sit down and eat. It only took one bite of the Katz Gluten Free Pumpkin Pie Spiced Glazed Donut for me to declare my undying love for it. No joke. First of all, this isn’t a heavy or dense donut at all. It is light…and airy and fluffy. And I love that, because too often I have to settle for heavy and dense baked goods when everyone else has these amazing treats that are soft and melt-in-your-mouth. AH…that’s what this donut does. It melts in your mouth. Each warm, moist, soft bite is fantastic…packed with all that pumpkin spice flavor that you love…without it overwhelming your palate. It literally is like eating pumpkin pie…without it actually being a pumpkin pie. Which, is good. Because while I love things pumpkin flavored, I have never liked pumpkin pie. I think it’s a texture thing. But I digress. The texture is just rich and soft and amazing. I loved the glaze, giving it that extra hit of sweetness without being too cloying. And…just…it’s one amazing breakfast bite for sure. I am in total love with these. I kind of don’t want the box of 6 to end. Just…fantastic. Of course, that’s what I have come to expect from Katz Gluten Free. Let’s discuss some of the chemistry that goes into these, shall we? The Katz Gluten Free Pumpkin Pie Spiced Glazed Donut is made from a gluten-free flour blend containing corn starch, tapioca starch, and white rice flour. These donuts also are made form water, palm oil, confection sugar, pumpkin, sugar, eggs, brown sugar, canola oil, baking powder, vanilla, xanthan gum, agar, calcium carbonate, calcium slufate, cinnamon, nutmeg, ginger, cloves, mace, and allspice. They are gluten-free, soy-free, dairy-free and nut-free. As far as nutrition goes…well, it’s a donut. But this isn’t bad for a donut. Honestly. A serving is, of course, just one donut. So try to stick to it. If I can do it – so can you!! This one donut will give you 160 calories and 10 grams of fat. This soft little morsel of pumpkin goodness will also provide 10 mg cholesterol, 170 mg sodium, and 9 grams of sugar. Which…isn’t bad considering we’re talking about a donut here. This serving will give you no fiber and only 1 gram of protein. No…it will not make you feel full for hours after eating it. Pair it, as I did, with something like an orange or a grapefruit or some apple slices. That should help…and helps bring balance. Donut…fruit. Perfect. I can’t get over how amazing these donuts were. I have tried so many gluten-free donuts and nothing ever compares to the way Katz Gluten Free makes theirs. I continue to be impressed by what they put out in the gluten-free market. These donuts are love. I definitely have a new favorite flavor. So good. Don’t take my word for it though…go order some and see for yourself! You don’t have to be gluten free to love the products (and especially the donuts) from Katz Gluten Free! This entry was posted in Baked Goods, Breakfast, Donuts, Food, Gluten-Free, Products, Pumpkin, Review, Snacks, Sweet Stuff, Vegetarian by The Celiathlete. Bookmark the permalink.